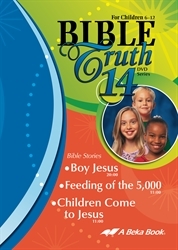 DVD contains three Bible stories involving children. “Boy Jesus” explains how Jesus pleased His heavenly Father as a child and encourages boys and girls to examine their hearts for selfishness, anger, laziness, and other sins and ask God to make their hearts clean (20 mins.). “Feeding of the 5,000” describes how Jesus, the Living Bread, multiplied a little boy’s gift of his lunch to bless many (11 mins.). “Children Come to Jesus” teaches the blessings of coming to Jesus in faith as a child (11 mins. ).